(NucNet): South Korea is expected to resume the stalled construction of two nuclear reactors after a state commission recommended doing so despite president Moon Jae-in’s campaign promise to scrap the projects. The commission, composed of 471 citizens, said 59.5% of its members supported resuming building the Shin Kori-5 and Shin Kori-6 reactors, near the southeastern city of Ulsan and under construction since last year. However, 53.2% of the members were in favour of the government policy to reduce nuclear power generation. The commission was established to look into plans announced by president Moon to suspend construction of the two reactors for three months as part of a government policy to phase out nuclear power in South Korea, whose 24 commercial reactor units are responsible for about 30% of electricity supply. Reports said KHNP has already spent about $1.4bn (€1.2bn) on construction of the two pressurized water reactors and there might be legal and compensation issues if construction was completely halted. Other media reports said “nearly 30% of construction of the two reactors that was estimated to cost $7.5bn has been completed so far.” South Korean media reported on October 20, 2017 that construction is expected to resume next week because the government is likely to endorse the recommendation in a cabinet meeting on Tuesday. In a blog post, he writes, “In a stunning come-from-behind victory, South Korean citizens on a special jury voted 60 percent to 40 percent to re-start construction of two halted nuclear reactors. 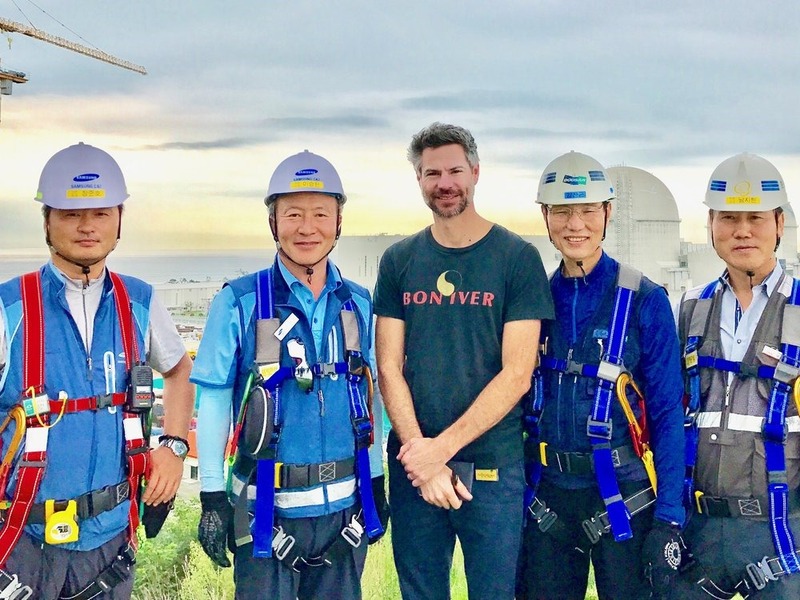 Michael Shellenberger, MD, center, with workers from the Shin-Kori 5 & 6 nuclear reactor site. Shellenberger traveled to South Korea several times to advocate for restart of the twin 1400 MW PWRs. The size of the victory was as unexpected as the victory itself. The minority of South Koreans who told Shellenberger last week that they thought pro-nuclear forces would win thought it would be by the thinnest of margins. Moreover, the youth vote — citizen jurors in the 20s and 30s — changed their mind more than did older voters. This is especially significant since young people were President Moon’s base of support in his electoral victory last May. (Reuters) South Korea’s President Moon Jae-in said 10/22/17 the government will continue to phase out nuclear-generated electricity, following a public opinion survey that dealt a blow to his plans to do so. Moon also reiterated his plan to shut down the Wolsong No. 1 nuclear reactor, the nation’s second-oldest, once the government confirms stability in energy supplies. The 697-megawatt reactor in southeastern South Korea was taken offline in 2012 after reaching its 30-year lifespan, but the regulator approved a restart a few years ago until 2022. South Korea has 24 nuclear reactors, supplying a third of its electricity. It is believed that Moon plans to work with Russia to build an undersea natural gas pipeline from Sakhalin Island. Realistically, there isn’t that can be done in the US about political trends in South Korea regarding nuclear energy. Moon’s political history includes a proposal for peaceful reunification of North & South Korea. Moon’s family came to South Korea as refugees from the North. His history of political activism includes campaigns to root out corruption among the nation’s corporate and government elites. His attacks on nuclear energy should be seen as attacks on the business establishment rather than opposition to the technology. Moon has accepted the vote of the citizens panel to restart construction of the two Shin Kori 1400 MW PWRs. However, he has also pledged to seek closure of aging nuclear reactors and not allow any other new starts. He’s not backing down. The U.S. 1-2-3 Agreement with South Korea is mostly concerned with that nation’s plans for management of its spent nuclear fuel from the current fleet of commercial reactors and its target markets for export of its light water reactors. NucNet) South Africa’s Department of Environmental Affairs (DEA) has granted permission to state-owned utility Eskom to proceed with its plans for a proposed new-build project at the Duynefontein site, Eskom said in a statement. The DEA has approved Eskom’s final environmental impact report for the Duynefontein site, which is near the existing Koeberg nuclear station on the southwest coast of South Africa. Dave Nicholls, Eskom’s chief executive officer, said the company welcomes the DEA’s decision and sees it as a ”milestone” in the development of South Africa’s nuclear program. He said Eskom considers both the Duynefontein and Thyspunt sites as equally capable to host its Nuclear-1 new-build project, although the company has worked on Thyspunt as the preferred option. South Africa is aiming to build up to 9,600 MW of new nuclear capacity. The two-unit Koeberg nuclear station outside Cape Town is the country’s only commercially operating nuclear station. In April 2017, Eskom’s nuclear program experienced a setback when a high court declared a number of procurement deals with Russia, China, the US, South Korea and France illegal. Last month, Eskom said it was ready to restart the procurement process, but determining the exact timing was up to the South African government. The South African government’s efforts have been distracted by political controversies sparked by ANC President ZUMA who has hired and fired three finance ministers and two energy ministers. Charges of corruption and the hiring of relatives of Zuma’s close political supporters have also created a media frenzy about the nuclear action. It remains unclear how South Africa will pay for the reactors. The country is officially in a recession and had, as a result a high rate of unemployment. (NucNet) The Turkish Atomic Energy Authority (Taek) is working on the construction licensing process for the country’s first nuclear power station at Akkuyu with construction now scheduled to begin at the end of 2017 or in early 2018, Turkish energy minister Berat Albayrak was quoted by the state-run Anadolu news agency as saying. The €20bn ($23.6bn) Akkuyu, near Mersin on Turkey’s southern Mediterranean coast, is to be built in cooperation with Russia under a contract signed in 2010. The station will have four 1,200-MW VVER units with the first expected to come online in 2023. (NucNet) The UK government has put forward key proposals for decarbonising all sectors of the country’s economy through the 2020s, including investing £460m (€517m, $611m) in the nuclear energy sector to support work in areas including future nuclear fuels, new nuclear manufacturing techniques, recycling and reprocessing, and advanced reactor design. The Cleveland Plain Dealer reports that FirstEnergy’s legislative supporters have introduced a new bill in the Ohio House that would create special customer charges to subsidize the company’s nuclear power plants because they cannot compete with new ultra-efficient gas turbine power plants. House Bill 381 would cost customers less than an earlier proposal — adding about $2.50 a month or $30 a year to consumer bills. That’s about half what the company originally asked for. Commercial and industrial customers would have to pay an additional 5 percent on top of their monthly bill, or $3,500, whichever is lesser, under the new legislation. The proposal would give the company about $180 million a year in money earmarked for Davis-Besse and Perry nuclear plants for the next 12 years. The company had sought $300 million a year for 16 years. State Rep. Anthony DeVitis, a Republican from Green, introduced both H.B. 381 and the earlier H.B. 178, which drew heavy opposition and concern among lawmakers facing re-election next year.